A favourite pastime of mine when I can find the time, is scrapbooking. I became interested in scrapbooking a couple of years ago and one of my first projects was a Memory Book for my baby sister Kathryn to celebrate her big 40 Birthday. I created a scrapbook page for every year of her life. Earlier this week, Virginia, a member of The Inspired Scrapper Design team blogged about Vacation and Getaway scrapbook layouts and asked us to share some of our own LO's. Some of the pages in Kathryns book featured vacations, including her and husband Andrews 10th wedding anniversary trip to Venice. On a visit to us here in France. In 2007 we spent some time enjoying the area around Denia in Spain. Mr B at the top of the Empire State Building NYC, 2009. Life's a beach in Hilton Head. I've really enjoyed leafing through my vacation scrapbook today, hope you've enjoyed taking a mini vacation with me too! 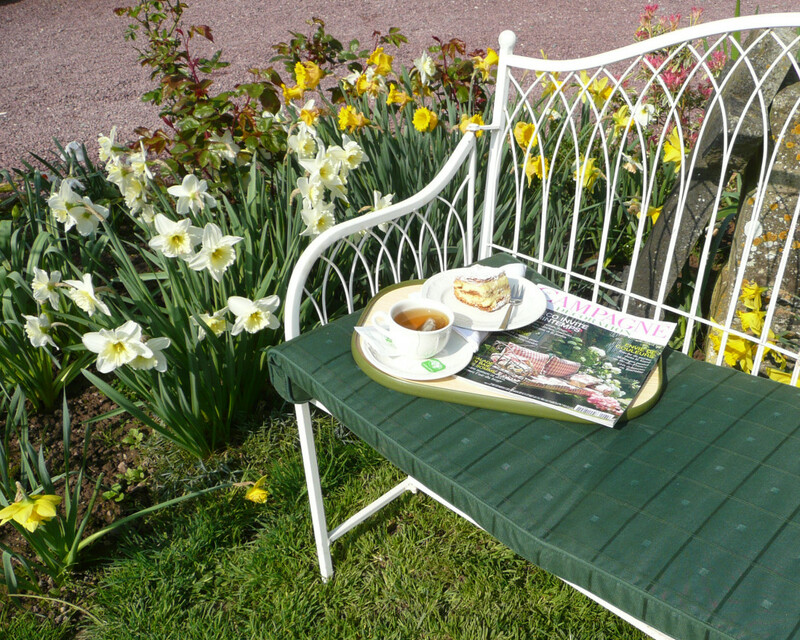 Celebrate Spring with Victoria @ A Delightsome Life. 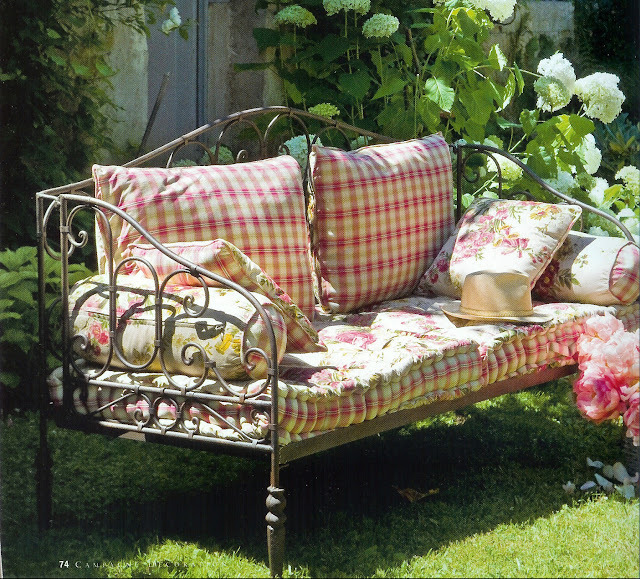 When Spring arrives in Normandie it's time to bring out the garden furniture and place it in the sunniest spots. On the patio; next to the vegetable beds in the potager; and in shady spots on the grass, under the apple tree. 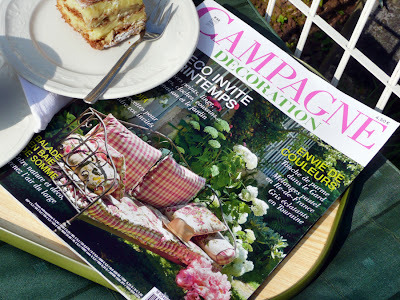 For Kathy's Celebrate Spring with Victoria party, over at her blog A Delightsome Life, I'd like to share with you some inspiration from a beautiful French magazine: Campagne Decoration. 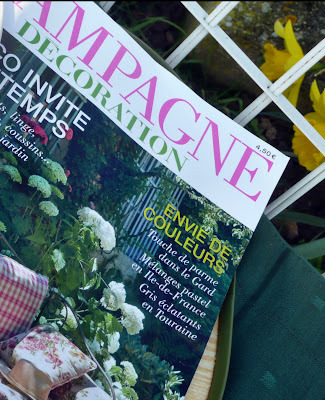 You may remember that I've blogged about this gorgeous magazine before, click here and here to see more. On Sunday afternoon I sat down in a sunny corner of our garden, opened the latest Spring issue of CD and was instantly transported to a garden so stylish, so chic, so very French. Click here if you missed my First Day of Spring post. An outdoor lifestyle that I can only dream of, je reve! The air is more soft, the sun caresses the shuddering leaves. In every plant hatches a promise of happiness. 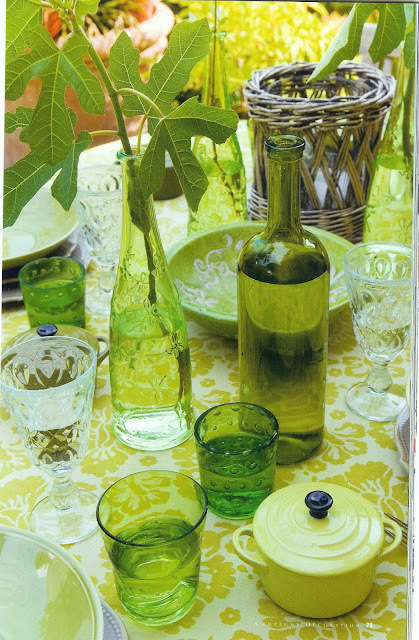 Photographs Stephen Clément,Campagne Decoration, Edition #68 Mars/Avril 2011. 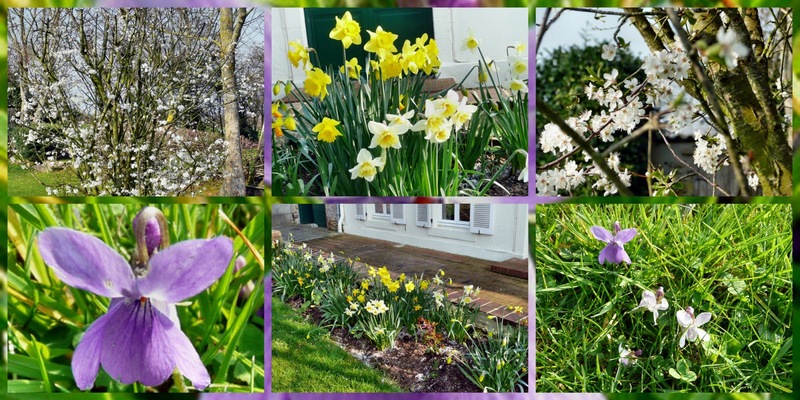 Please join Kathy and all the other Springtime bloggers gathered together to Celebrate Spring today, just click here or on the sidebar button! 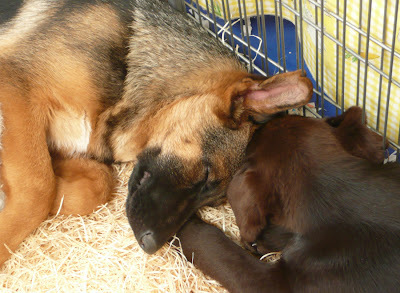 Fleur is settling in very well, has now lost all her baby teeth and is getting bigger every day. 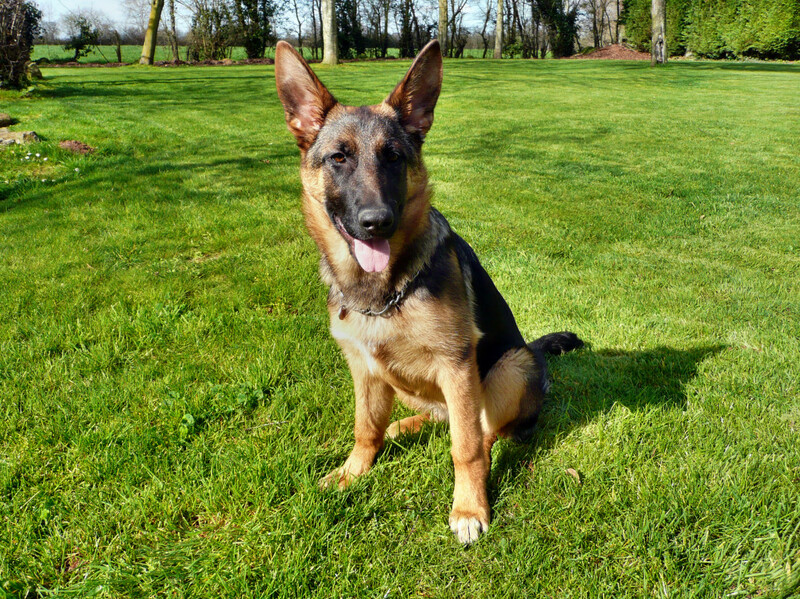 She likes to dig holes and bury stones! 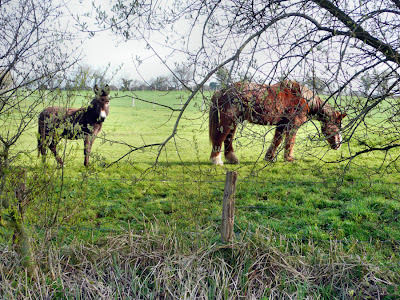 First Day of Spring - Sunday in Normandy. All its flowers, and leaves, and grasses. The first day of spring in Normandy can mean different things to different people. Time to get in training. 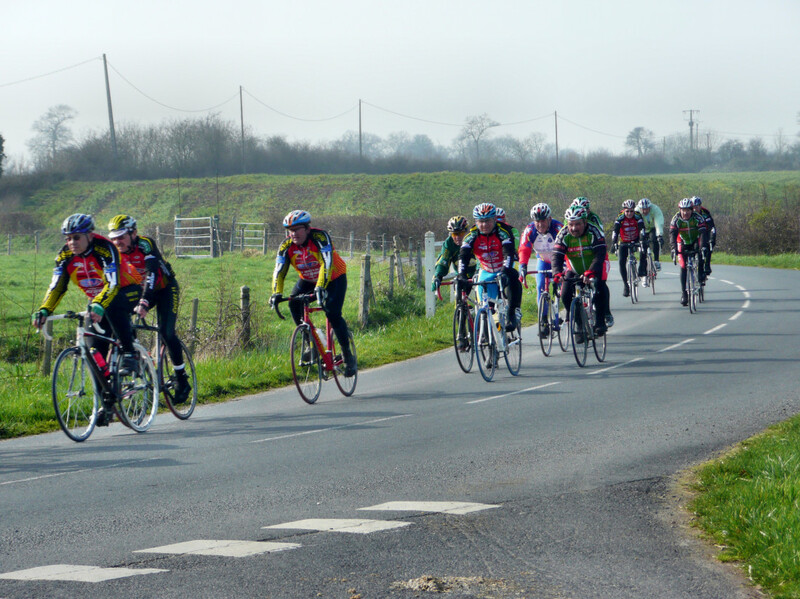 The Tour de France will be here before you know it! Out in the fields once again. 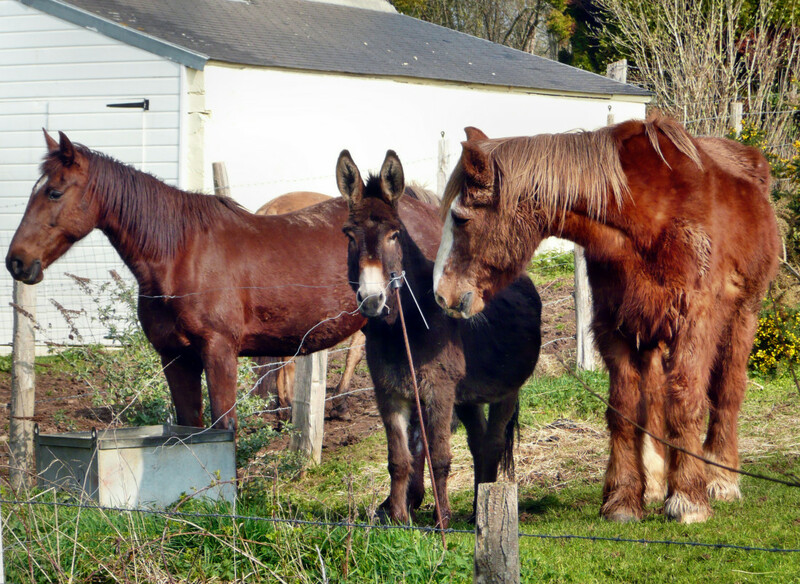 It's good to be out of the barn at last. Millefeuille, tea and a beautiful magazine. Joining The Tablescaper for Seasonal Sundays with these scenes of la vie quotidienne en Normandie. May your First Day of Spring be just as beautiful. A Gathering Light - Jennifer Donnelly. 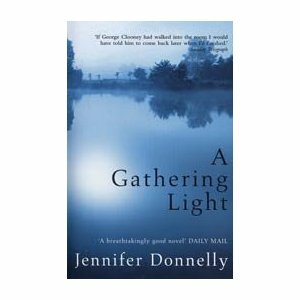 A Gathering Light by Jennifer Donnelly. I really enjoyed this novel when I read it earlier in the year, it wasn't until I'd finished it that I discovered that it was based on a true story. A Gathering Light is a wonderful coming of age story. The year is 1906, the place upstate New York and sixteen year old Mattie Gokay is doing her very best to hold her family together since her mother passed away. Her elder brother ran away from home after a terrible, unexplained fight with their father and so, as the next eldest, her days are spent helping run the family farm, milking cows, cooking, cleaning and looking after her younger siblings whilst struggling to find enough time in the day to study for her high school diploma. Her passion is writing and when she can she devours the books of Jane Austen, the Brontes and Edith Wharton amongst others. To earn more money she takes a job as a maid at the Hotel on Big Moose Lake, all the while she is constantly trying to decide whether to follow her dream to attend University in NYC, as her teacher Miss Wilcox constantly encourages her to, or stay close to her family marry and raise a family of her own. One fateful day she is entrusted with some letters by a young woman, Grace Brown, who asks her to burn them in the hotel furnace. The subsequent murder of Grace Brown and Matties involvement in bringing the murderer to justice, brought about by reading not burning the letters, will change her life forever. Marks out of 10 for this book - 5, would recommend as an easy holiday read . Whilst replenishing my pantry with baking essentials recently I came across a packet of dried cranberries, they were meant to have gone into a Christmas relish but somehow I had overlooked them during the holiday period. 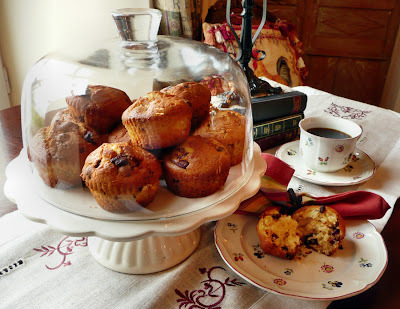 One of my mottoes is "If in doubt ~ bake"
It isn't really a motto, I just made it up so that I could share with you this great recipe for chocolate and cranberry muffins which I came across when I googled "dried cranberry recipes". 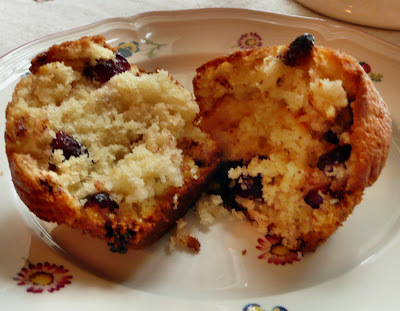 Cake, Crumbs and Cooking is a great blog authored by a "twenty something baking enthusiast living in the north of England". 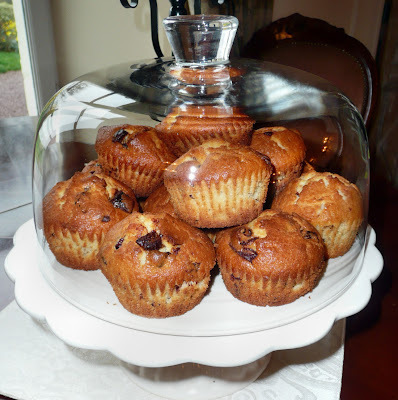 Now I don't know whereabouts in the North this young baker hails from but as a "Lassie from Lancashire" and lover of all things to do with baking myself, this blog ticked all my boxes and I signed up to follow along. If you're a baker or cake maker you might want to check out the recipe too by clicking here. 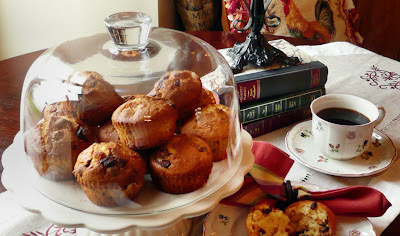 Being me, I tweaked the recipe just a little bit. I didn't have any dark chocolate in the pantry, which is unusual, but I did have a bar of Lait Bricelet, a Swiss milk chocolate with a creamy hazelnut and wafer biscuit filling which I used instead. Also, a tip that I learned a long time ago when using dried fruit of any kind, always toss the fruit in a little of the flour before adding to the mix. It helps to stop all the fruit falling to the bottom of your cake or muffin. A small thing but well worth doing. 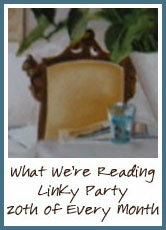 Linking this post to Full Plate Thursday over at Miz Helen's Country Cottage, a weekly gathering of cooks and bakers with recipes and good food to share. The muffins turned out great, very flavourful - perfect with a cup of hot coffee. I would just mention though, that if like me you use milk (with or without a sweetened nutty filling) not dark chocolate and don't have a very sweet tooth, you may want to reduce the amount of sugar in the recipe. 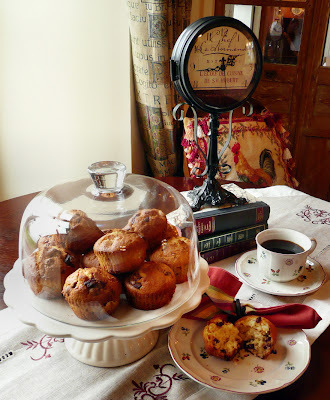 Linking also to Kathryns Muffin Monday @ Talking Dollars and Cents, click on the link for more muffin recipes. 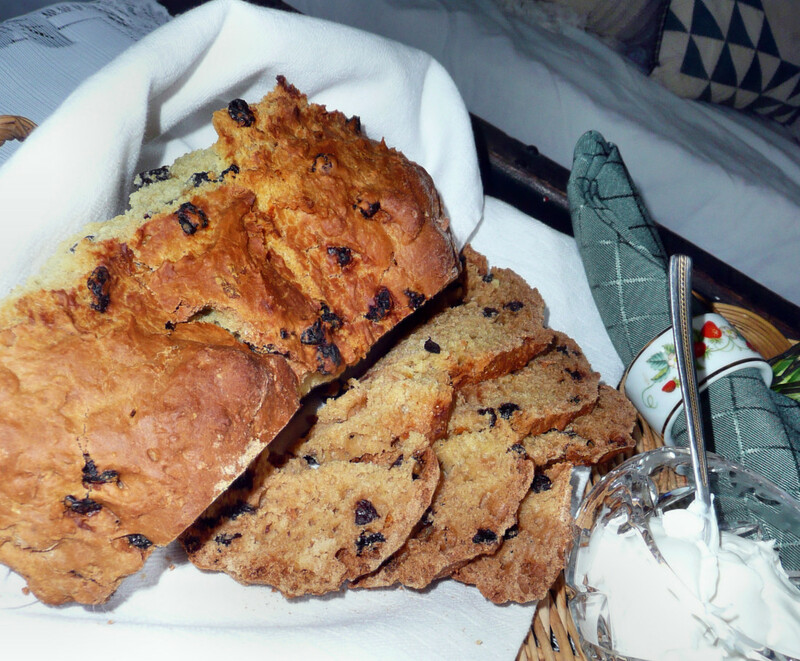 Ina Garten's Irish Soda Bread and a peek inside the Presbytère. Lynn @ Happier Than a Pig in Mud has invited us all to take part in her Celebrity Cook - Along this month with TV Chef and prolific Cook Book author Ina Garten. 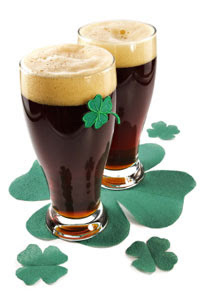 Cuisine Kathleen is also hosting the 3rd Annual St Patricks Day blog crawl. Click on the links or the sidebar buttons to join the parties. To celebrate St Patricks Day I made Ina's Irish Soda Bread and invited a couple of dear old friends, Brian and Bree Bear, to share this tea time treat. 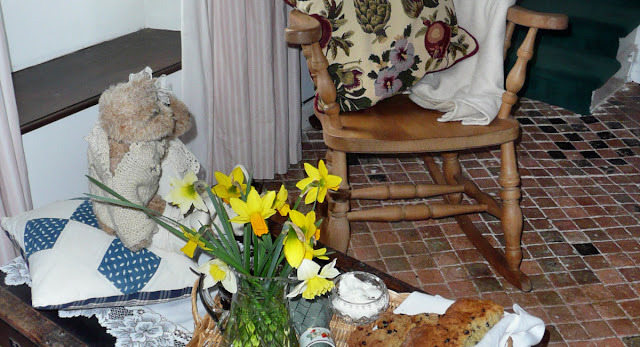 We'll be taking tea in the 16th century part of the house today, in the Bishops bedroom of the Presbytère. 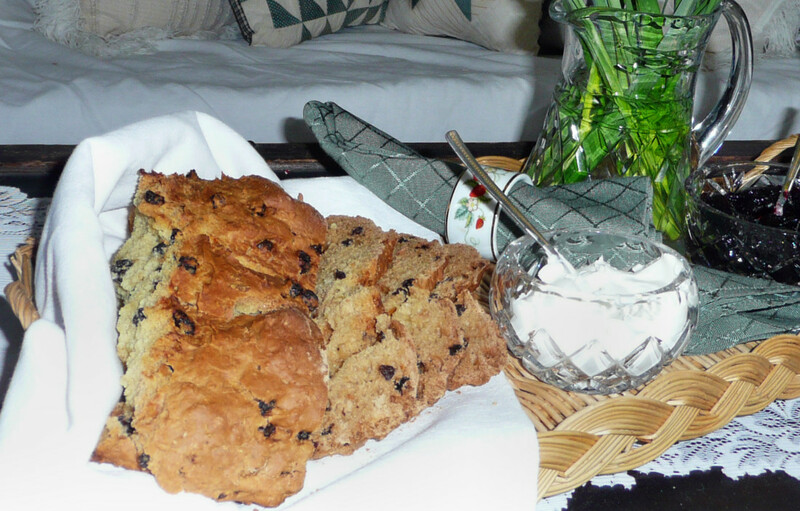 Click here to get Ina's Irish Soda Bread recipe from The Barefoot Contessa At Home cookery book. Brian sends his apologies but he didn't have time to change out of the holey aran sweater which he likes to wear when gardening. 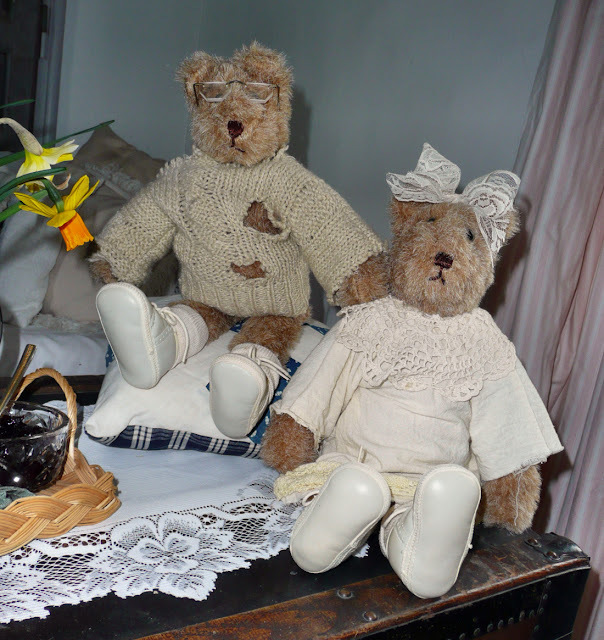 As you can see Bree has gone to a lot of trouble with her appearance and is wearing a favourite linen dress trimmed with Irish lace and a matching hair ribbon. 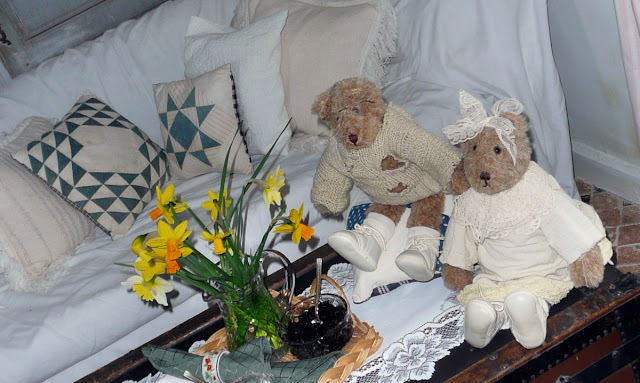 She's not too pleased that Brian looks a little scruffy, but at least he took off his muddy boots and put on indoor shoes, and he did bring me daffodils from his garden. 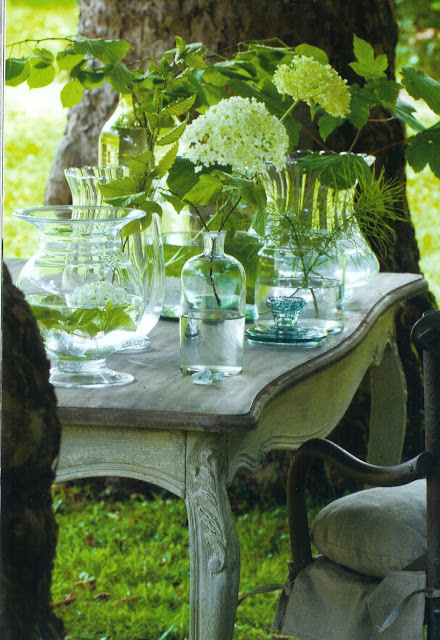 I popped them straight into a cherished Waterford crystal pitcher, a wedding present many moons ago. Why not pull up this wooden rocking chair and join them for a slice of soda bread, the orange zest and currants make this a tasty tea time favourite. There's mascarpone cream and black cherry preserves in the Waterford crystal bowls, do please help yourself. 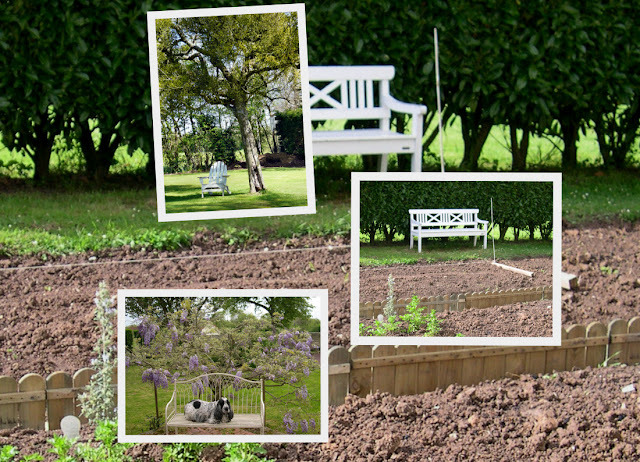 Perhaps you'd prefer to settle back amongst the cushions on our comfy sofa? Excuse me just for a moment, I must go and see if the kettle has boiled. I'll be back in a jiffy with the tea. 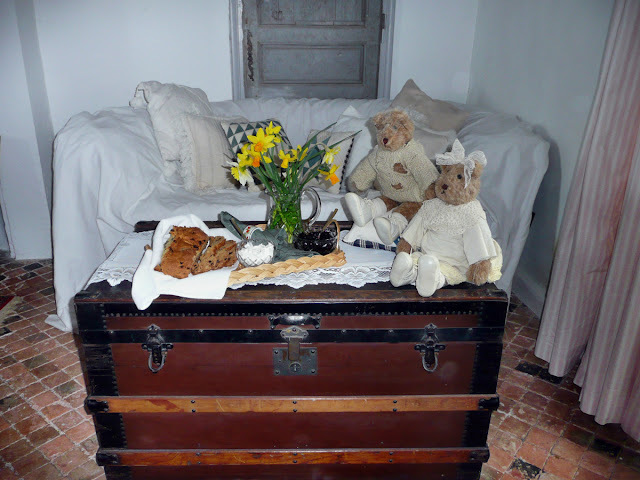 In the meantime, if you would like to know a little more about the Bishops bedroom why not sit back and enjoy these photographs of a very special place. 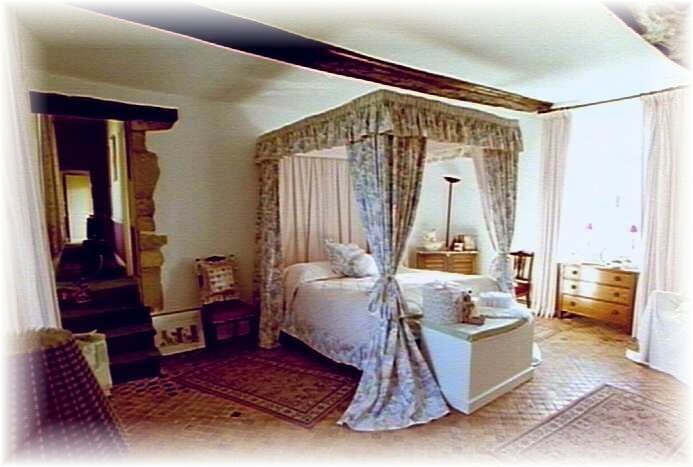 It's a beautiful, peaceful room which still has the handcut terracotta tile floor original to the house, circa late 1500's. Simple white plaster walls and an eclectic mix of antique and vintage pieces. We discovered the beams in the ceiling, above the windows and doorway, and the Caen stone surrounding the doorway when we were renovating this part of the building. 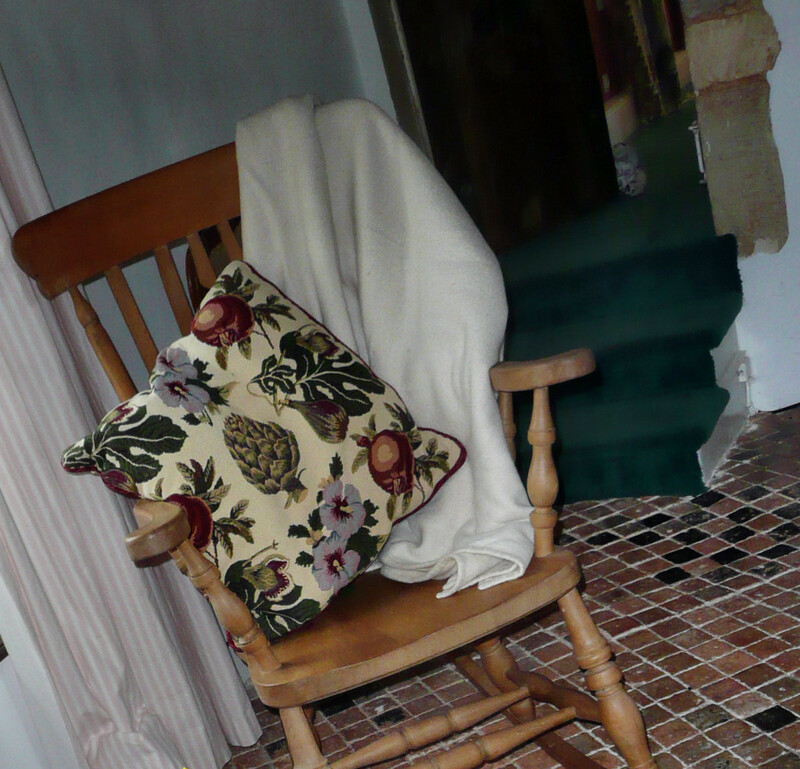 Chiselled into the stonework, at the side of the doorway, we also found the date 1787, which we believe was done to mark the "new addition" to the house. The fireplace and decoration on the chimney breast are original too, we think. 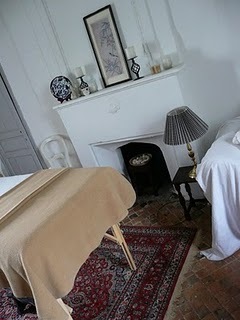 It is the perfect place for a Reiki treatment. 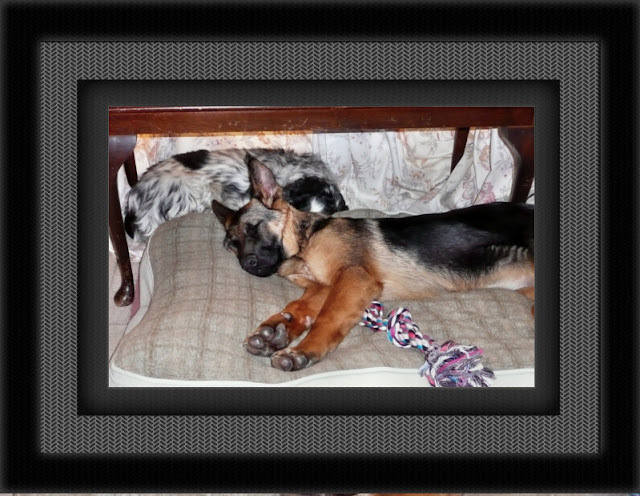 Click here to see the post of how I use the Bishops bedroom as my Reiki space. I've so enjoyed your visit and showing you around a part of our Normandy home. I hope you'll come back again soon. There may be crumpets for tea next time. Dingle Town, Dingle Peninsula, Ireland. 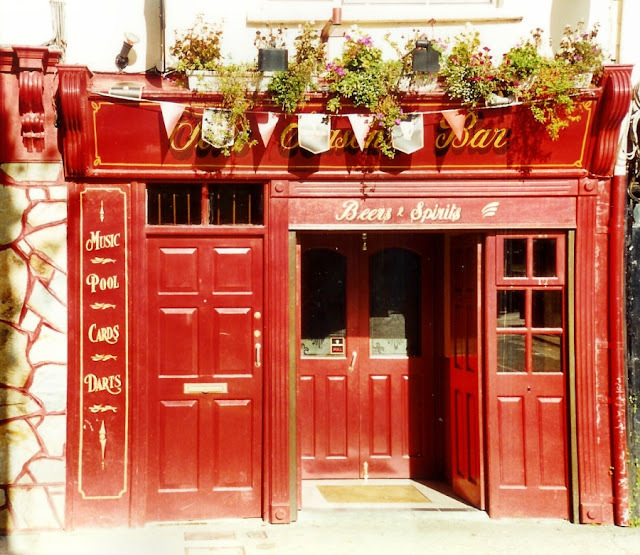 Blogland is gearing itself up for St Patricks Day on Thursday and so for Chari's Sunday Favourites this week, a post from last year recalling a visit to Ireland that we made many years ago. 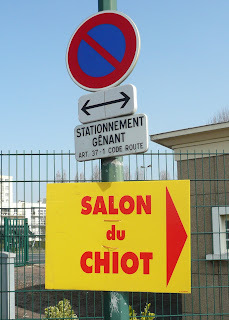 Chari very kindly hosts this wonderful Sunday gathering so that we may reprise our favourite posts of the past. 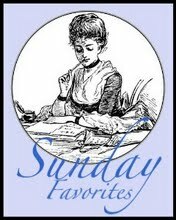 Click here or on the Sunday Favourites button on my sidebar to visit Chari and see who else is participating this week. 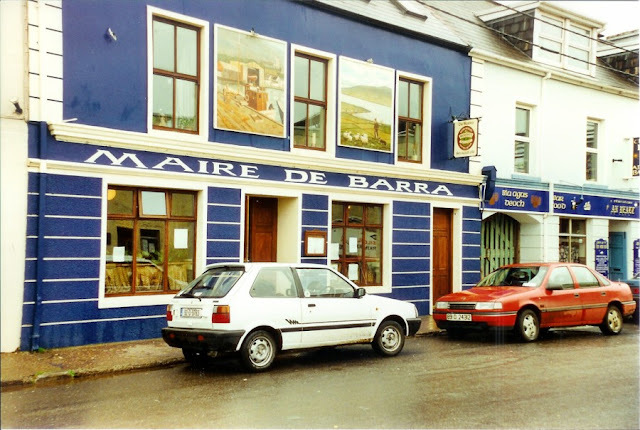 About 20 years ago DH & I spent a few days visiting the Dingle Peninsula, Ireland. Our base was Milltown House in Dingle town, the only town on the peninsula. The film director Michael Winner had written about this guesthouse in his weekly column for the Sunday Times and we were keen to try it for ourselves. Do you remember the wonderful film "Ryan's Daughter"? It was fimed in the area and the actor Robert Mitchum and his family lived at Milltown house for over a year whilst filming was going on. 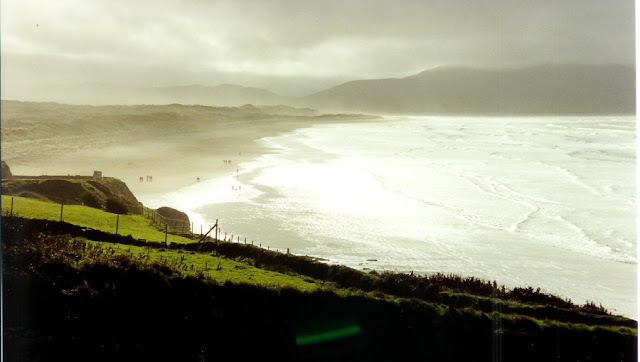 DH took this dramatic shot of Coumeenole Beach, Slea Head, where part of the film was made. "When Sir David Lean and the cast of Ryan's Daughter arrived in Dingle to start filming, it heralded the start of the Dingle Peninsula as a tourist destination. The superb cinematography and the natural beauty of the area as depicted on screen helped to make Dingle the popular holiday destination it is today. That was over 40 years ago, and since the completion of the movie, many of the cast and crew returned to Dingle on holidays, some settled here permanently. It is the sheer majesty of the landscapes and panoramic vistas that attracted the film makers, adding unique scenes to unique movies." Dingle is a very picturesque town with a harbour full of colourful fishing boats and plenty of even more colourful pubs. Many of the pubs are also shops selling anything from bread and groceries to leather goods and hardware. One half of the premises is a pub and the other the shop. 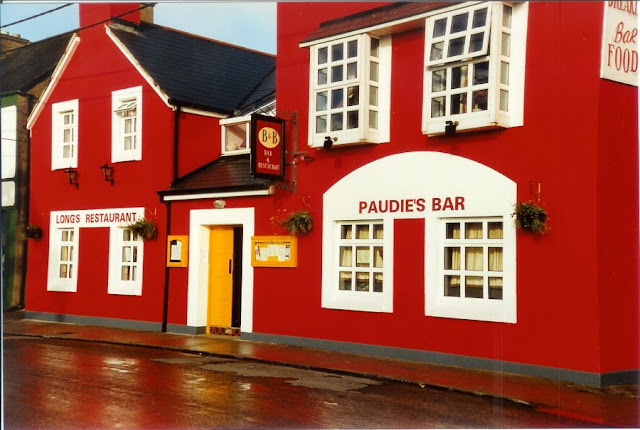 If I recall correctly this pub had a tiny enclosed parlour, seperated from the main bar. 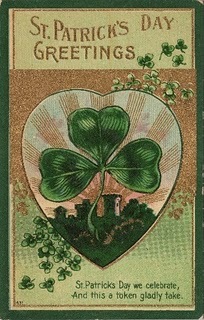 To learn more about St Patrick's Day, Ireland, Irish beer & much more click here. Linking this post also to the Tablescapers Seasonal Sunday gathering, click here or on the sidebar button to join in too. Outdoor Wednesday - Spring has sprung! Spring lambs with their mums. Spring flowers in our back garden. The bees were already hard at work on the white ornamental cherry blossom. 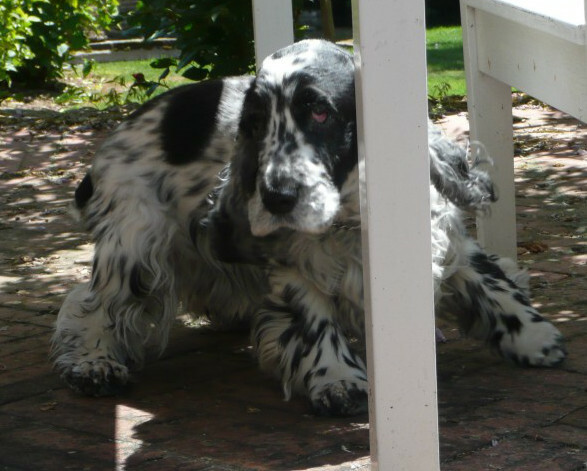 ﻿Not too much time available to blog since Mme Fleur arrived at the weekend and Mr Darling Husband flew the coop for a business trip to the UK! 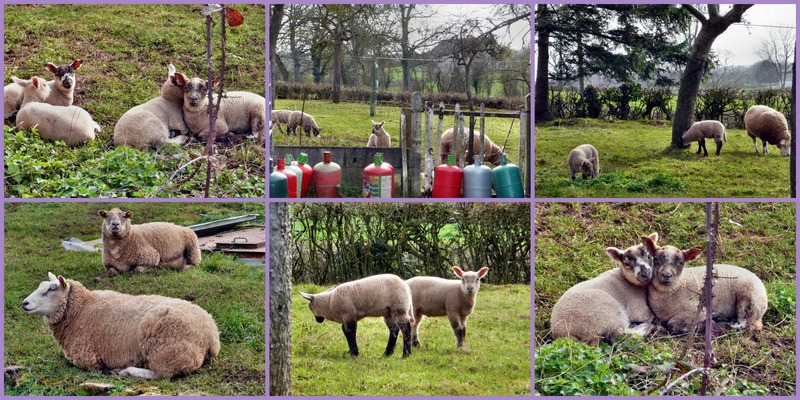 I just had to share some pix, taken on a recent Sunday morning, of the new lambs that Jacques the owner of our village epicerie has in the field next to the shop. Also some very quick snaps taken in our back garden Tuesday afternoon whilst Fleur & Ben were chasing around like whirling dervishes, bonding over a tennis ball. All the shots I took of their playtime were too blurred to share but I'm sure you can picture the scene, n'est pas? 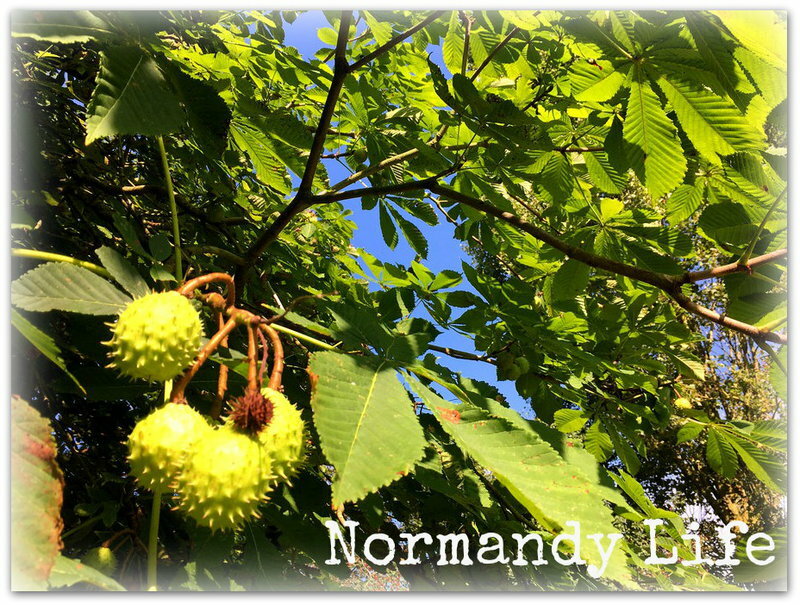 Joining Susan for Outdoor Wednesday @ A Southern Daydreamer and Jill @ The French Cupboard for French Inspiration Thursday with this slice of rural Normandy Life. 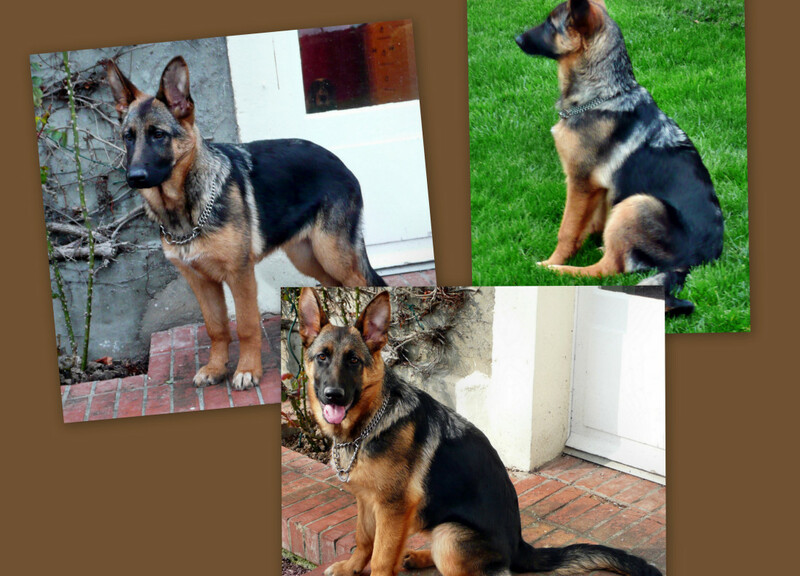 What a difference 48 hours can make. "If you want to make God laugh, tell him your plans". Well, yesterday we hadn't planned on adding to our small family of Mr Ben, Mr B & me but then God laughed and now we are four. 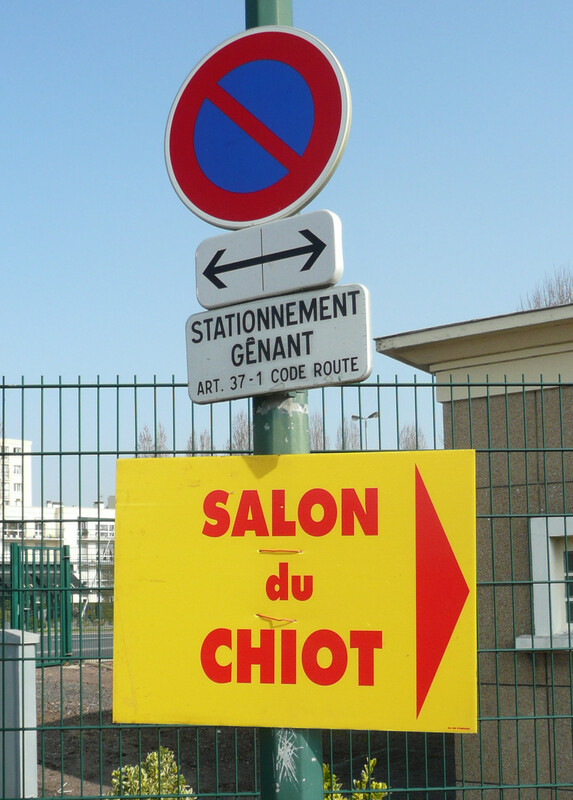 O.K.maybe we were tempting fate by taking a drive over to Caen to visit the Chiot Expo taking place at the large exposition centre. 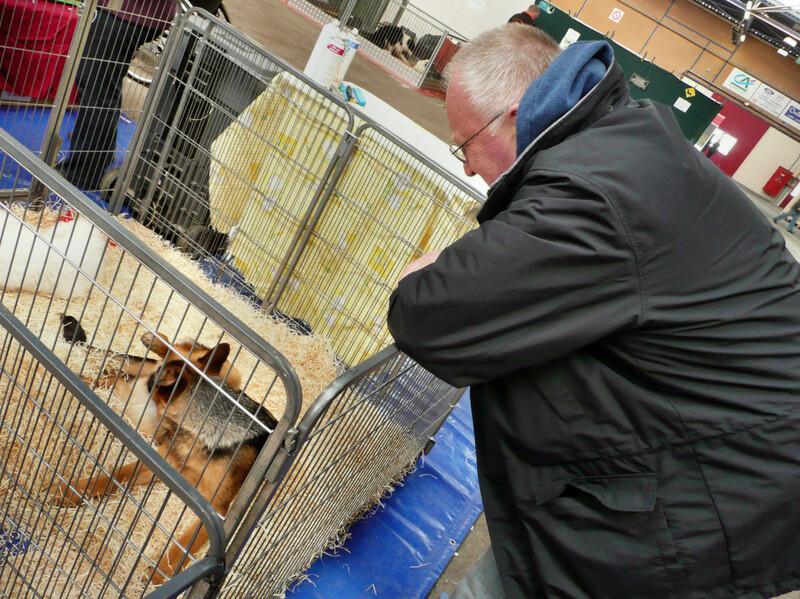 45 different breeds on show but how likely was it that one of the hundreds of wriggly little furballs, competing for our attention, would capture a heart? Can you hear God laughing now? 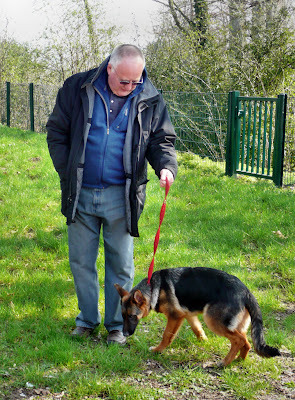 This is our new addition, a female pedigree Berger Allemand a.k.a. German Shepherd a.k.a Alsatian, almost five months old, born on the 14th October 2010. 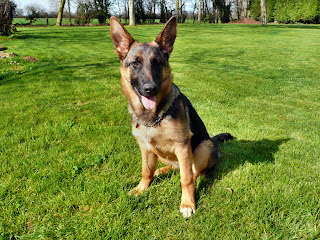 The breeder had not previously named her that honour went to the new owners, us, and so in keeping with the "one letter per year" system and F being the letter for 2010 we decided to name her Fleur. Fleur de L'Ange Quentin to be precise! Until 1926, there was no rule in France for naming a dog registered in the LOF. From this year, the S.C.C. decided that all dogs born in the same year would have a name beginning with the same letter, which would simplify the work of dog genealogists. The letter "Z" was excluded because one though that the choice of names beginning with this letter was not big enough in French. 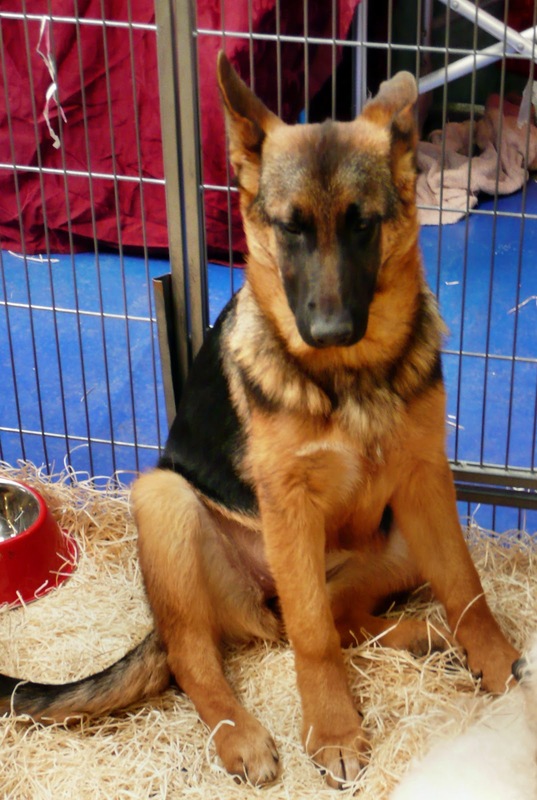 One should be aware that for several years after, some breeders didn't follow this new rule. 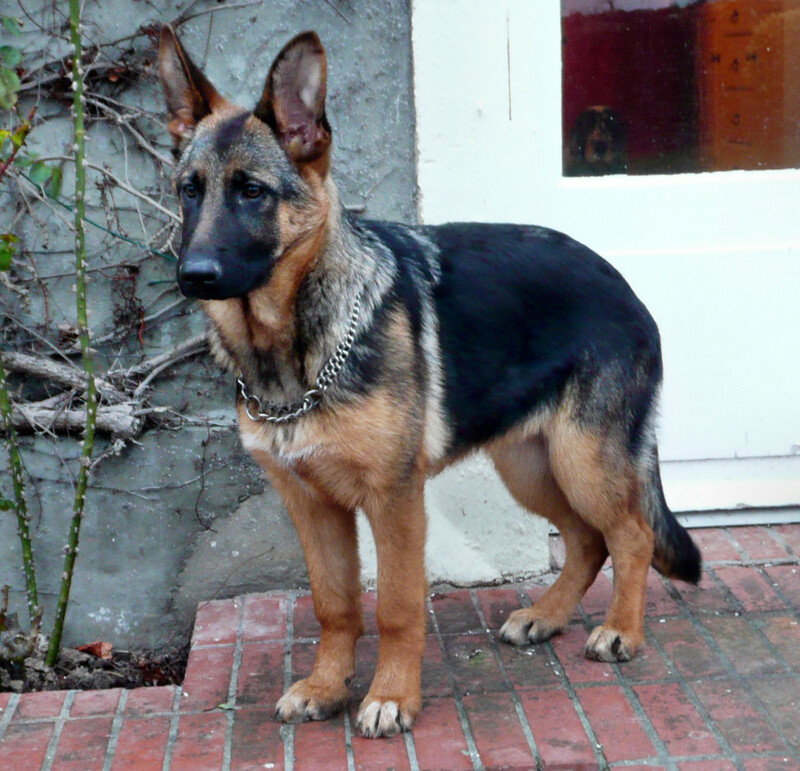 Her Mum's name is Diana and Daddy's is Chips! The only change to this system happened in 1972, when the Commission Nationale d’Amélioration Génétique (National Committee for Genetic Improvement) decided to standardize the yearly letters for all animals. Five letters (K, Q, W, X, Y) were removed, for the same reason which had lead to the exclusion of "Z" in 1926, and it was decided that "I" would be used for 1973. 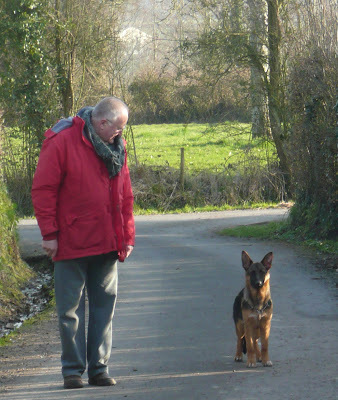 Note: with the use of typewriters, the French Kennel Club decided to use only capital letters for dog names, not including accents and special characters. Today it is still the case, and many letters used in French cannot be used for dog names: À, à, Â, â, Æ, æ, Ç, ç, É, é, È, è, Ê, ê, Ë, ë, Î, î, Ï, ï, Ô, ô, Œ, œ, Ù, ù, Û, û, Ü, ü, Ÿ, ÿ. 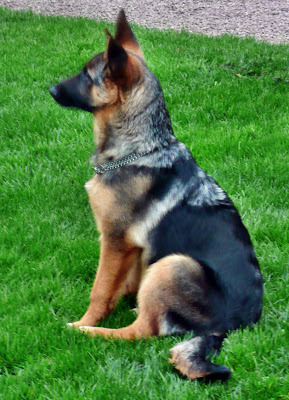 What more can I say, she's beautiful, intelligent, obedient and ours. that this was a good idea! Joining Mary @the little red house for Mosaic Monday, click here, or on the sidebar button to see who else is participating this week.